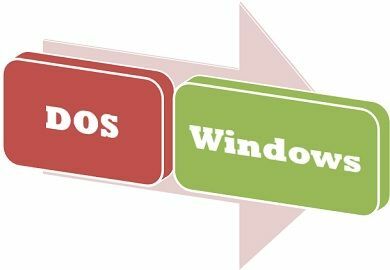 DOS and windows are the different kinds of operating systems where the DOS is less likely used in the present scenario while windows is a widely used operating system. The operating systems, DOS and Windows are mainly differentiated by the fact that DOS is a single tasking, single user, CLI based operating system developed in the year of 1979. On the other hand, all the windows version are multitasking, multiuser and GUI based operating system. Features Single processing or tasking and single user. Multitasking or multiprocessing and multi-user. Use of peripherals Allow the use of keyboard Use of mouse and keyboard both is permitted. Versions DOS/360, IBM system/360, DOS 11, TRS DOS, MS-DOS, 86 DOS. Windows 1.0, 2x, 3x, 9x(95 and 98), NT, 2000, XP, Vista, 7, 8 and 8.1, 10. DOS stands for Disk Operating System is a single-tasking system which means at a time only one program can run in the system. It is comprised of command interpreter which is called after the computer starts. A simple method is used to run the MS-DOS programs. No new process is generated during the execution of a particular process. It is a command line interface operating system where to accomplish any task we need to give instruction to the computer in the form of commands. It basically runs from the hard disk drive or any of the disk storage devices like a floppy disk or optical and provides an environment for the execution of the programs. MS-DOS loads the program into the memory allocating the largest space possible to program. DOS does not provide multitasking capabilities, however, there is a provision of concurrent execution to some particular extent. 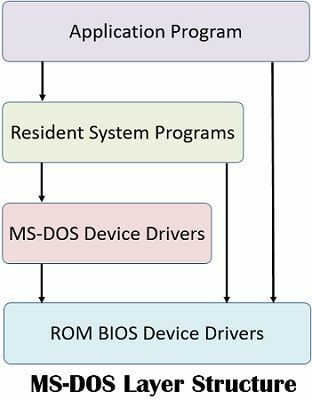 IO/SYS – It involves an interface between MS-DOS and I/O subsystem. This permits the OS to interact with the basic peripherals performs input/output tasks. 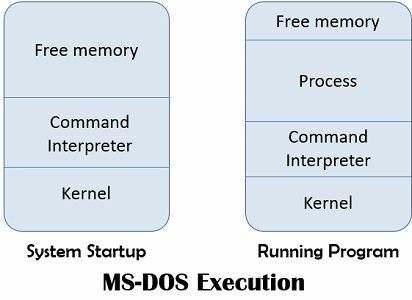 MSDOS.SYS – It is the kernel of the OS which communicates with hardware and facilitates in processing the several DOS functions which contain software to manage files, execute application software and interface with hardware. COMMAND.COM – It is a command interpreter and used to interpret and display commands. It is comprised of an application program, resident system programs, MS-DOS device drivers and ROM BIOS device drivers. Creation, deletion and copying of files. Displays the information on the monitor. Windows is a Microsoft product there are various versions of Windows such as Windows 2000, Windows NT, Windows XP, Windows Vista, Windows 7, Windows 8 and Windows 10. Windows OS is created for serving features such as reliability, compatibility, performance, extensibility and internal support. It is GUI (Graphical User Interface) based where the instead of typing commands manually, we use icons and images to give instructions with the help of a mouse. Windows is portable, initially written in C and C++ languages where processor reliable code is separated in a dynamic link library (DLL) known as the hardware abstraction layer (HAL). Upper layers of windows depend on HAL, inspite of the hardware. It is very reliable and handles error conditions with ease. 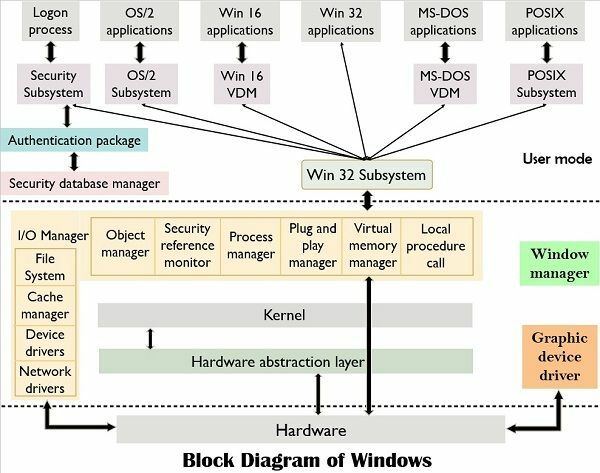 Windows operating system can defend the system from defects and attacks with the help of hardware protection for the virtual memory and software protection mechanism for operating system resources. It employs an NTFS file system which can easily recover from different kind of file system errors after the system crash. Windows 2000 is consist of three layers, a hardware abstraction layer, kernel, and executive. A Hardware abstraction layer is a software layer that disguises hardware dissimilarities from upper levels of the operating systems. HAL sends a virtual machine that is utilized by Kernel, the executive and the device drivers. It also offers support for symmetric multiprocessing. The kernel provides the foundation for the executive and the subsystems and provides operations such as thread scheduling, processor synchronization, power failure recovery, interrupt and exception handling. Executive provides a combination of services that all environmental subsystem can employ. Object, process and memory management, call facilities, I/O management, security monitoring are the services provided by the executive. DOS is a command line OS where users need to type the commands manually to give instructions to the system. As against, windows provides a graphical interface to the user where users can run an application just by recognizing icons and images. In terms of system complexity, the DOS was kind of complex as it requires the exact commands to be typed in order to execute an operation. On the contrary, this is not the case with windows and it is simple to use. DOS provides single programming, single tasking and single user environment while windows offer multiprogramming, multitasking and multiuser system. DOS permitted the use of keyboard only while with windows, mouse and keyboard both can be used. Windows supports multimedia application whereas DOS cannot support it. There are no drivers are used in DOS, therefore it involves the dealing with the hardware to get the job done. However, windows involve the use of drivers which made the work easier. DOS (Disk operating system) was earlier used, at present it is outdated and less likely used. Conversely, latter windows was developed which was enabled with many new features along with the old one. Hence, windows 1.0 provided backward compatibility with the DOS (It was capable of running the DOS softwares) along with introducing new features such as graphical user interface, multiprogramming, multitasking and multiuser system.